April’s frequent showers combined with longer days and climbing temperatures help plants around Oklahoma flourish. However, the bugs know this too and it’s their prime time for feeding as well! This sets up battle ground in your garden, and what you do now will affect your harvest in the summer. There are lots of companion plants, tools, and tricks you can use around your garden to help repel pests and attract beneficial critters. Check out our top rated iPhone and Android gardening app that makes it easy to manage pests organically! Although we generally plant our potatoes around St Patrick’s Day, the planting window extends into early April here in Oklahoma. There are many varieties and colors of potatoes you can grow, but the purple varieties have especially high nutritional value, and it’s cool to eat purple mashed potatoes! You could just plant potatoes from the grocery store, but they are often sprayed with chemicals to inhibit growth so we avoid that. We buy seed potatoes from Burpee or local nurseries. We have links to varieties from Burpee as well as all the information about how to plant them in our app. 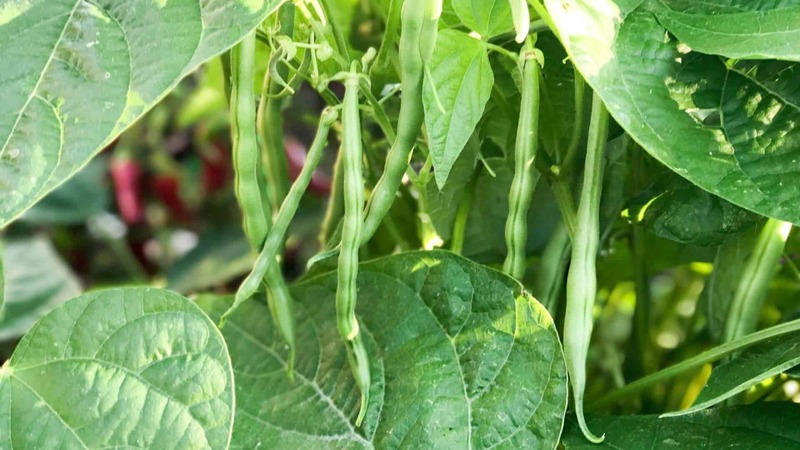 Beans are one of our favorite things to grow because they are prolific, easy, and have a taste that can’t be matched from store-bought! They can be planted in Oklahoma once we’ve had our last frost which is generally early April. Pole beans climb and will need support. These varieties will continue to produce all season and are great to plant along fences. Other varieties, known as bush beans, only grow to a few feet tall and then produce a lot of beans at once. These are great to grow in succession, planting new rounds of them every week throughout April and early May before switching to more heat tolerant Southern Peas. One thing about beans that blew my mind when I first started growing food was learning that dried beans, like pinto and black beans, are simply the seeds of green beans that have ripened! Simply let the green beans (or purple, yellow, etc.) dry on the vine and harvest the seeds inside to have dried beans. Depending on the weather, peppers and tomatoes can generally be planted after tax day in Oklahoma. Sometimes you can get away with planting before then, but it’s always a gamble. Be sure to ease transplants you buy from the nursery or start indoors over a week or two. Start introducing them outdoors for a few hours in the beginning, increasing a little each day until you transplant. Like beans, there are tomatoes that vine and others that bush and create all their fruit at once. We really like to grow peppers and tomatoes in smart pot containers. We have found it useful to put them inside of kiddie pools with a few inches of water for easy watering when it gets hot. The easiest tomatoes to grow in Oklahoma are smaller cherry varieties. Peppers are generally all pretty easy to grow and flourish in our Oklahoma summers. Basil is a great companion plant for tomatoes, and something we use frequently to flavor our dishes. Plant it all around your tomatoes to protect from pests and harvest the leaves for sauces or pesto. Check out our app for more recipes and information! Marcum’s (or K & K as I knew it) is so RAD! I have not been there since November and December of 2012. It was so foreign to me, with so much different material that is not available in California, but also a surprising selection of material that I expect to be more popular in California. Tropical hibiscus?